It is already known that the motor system, the part of the brain that controls our movements, communicates with the sensory regions of the brain. The motor system controls eye and other body part movements to orient our gaze and limbs to explore our spatial environment. However, because ears are immobile it was less clear what role the motor system plays in distinguishing sounds. 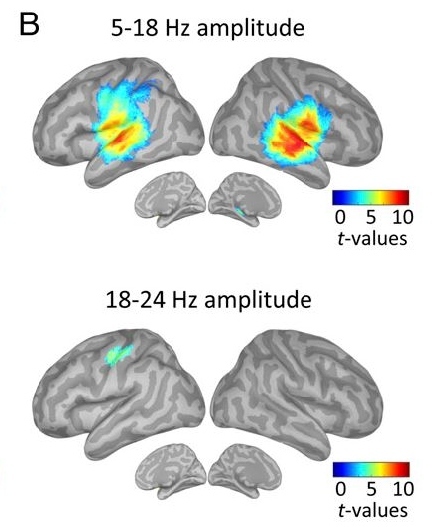 Benjamin Morillon, a researcher at the Montreal Neurological Institute of McGill University, designed a study based on the hypothesis that signals coming from the sensorimotor cortex could prepare the auditory cortex to process sound, and by doing so improve its ability to decipher complex sound flows like speech and music. MEG millisecond imaging revealed that bursts of fast neural oscillations coming from the left sensorimotor cortex were directed at the auditory regions of the brain. These oscillations occurred in anticipation of the occurrence of the next tone of interest. This finding revealed that the motor system can predict in advance when a sound will occur and send this information to auditory regions so they can prepare to interpret the sound. One striking aspect of this discovery is that timed brain motor signaling anticipated the incoming tones of the target melody, even when participants remained completely still. Hand tapping to the beat of interest further improved performance, confirming the important role of motor activity in the accuracy of auditory perception. This study was published in the journal Proceedings of the National Academy of Sciences of the USA on Oct. 2, 2017. It was made possible with funding from a CIBC MNI post-doctoral fellowship for neuroimaging research to Morillon, and support to Baillet from the Killam Foundation, a Senior-Researcher Award from the Fonds de recherche du Québec – Santé (FRQS), a Discovery Grant from the Natural Science and Engineering Research Council of Canada, the National Institutes of Health (2R01EB009048-05), and a Platform Support Grant from the Brain Canada Foundation.